Many condos feature spacious loft-style accommodations. The pool area is shaded by trees and adorned in flowers. There's ping pong and billiards in the game room. Gather 'round the BBQs for a cookout. 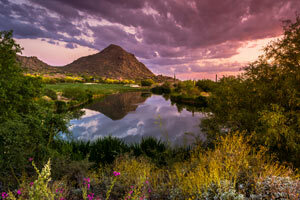 Villas of Cave Creek provides a peaceful family vacation away from the crowds of larger resorts. It’s a little adobe oasis on the edge of the desert mountains that surround you, near both Scottsdale and Phoenix. There are two outdoor pools surrounded by shade-giving trees, lounge poolside and enjoy the outdoors without roasting in the sun. Feel like burgers for lunch? Fire up the bbq grills for a family cookout. If you’re craving a good workout, check out the fitness center. It features cardio and weight equipment. Good news! It’s open 24/7, so you can get your cardio on when it’s convenient for you. Kids and grownups will love the game room; it has a pool table, ping pong, billiards, and board game rentals. Air-conditioned townhome-style two-bedroom villas sleep six guests and are two stories. Spend mornings making chocolate chip pancakes with the kids in your full kitchen. In-suite washer/dryers make post-chocolate cleanup a breeze. Living rooms feature a cozy fireplace and enough space for the kids and all of their blankets and pillow pets. Watch a Two and a Half Men rerun on the cable TV or have a family movie night thanks to the DVD player. Bring favorite movies from home or browse the selection of free DVD rentals available at the resort and get everyone comfortable on the couch. Once the kids have drifted off to sleep, enjoy a relaxing soak in the in-suite jetted tub, or take advantage of the hot tub on your private patio. But wait, there’s more! Villas of Cave Creek is a dog-friendly resort, so your four-legged family member doesn’t have to miss out on all of the fun. Right down the road, there are several mom-and-pop restaurants, along with cafes and shops. If you’re looking for a Southwestern souvenir, try Town Dump, which has a unique collection of vintage items and knick-knacks. Sports fans will definitely want to check out Peoria Sports Complex and Salt River Fields at Talking Stick. Peoria is the spring training home of the San Diego Padres and Seattle Mariners and Salt River Fields is the spring training home of the Arizona Diamondbacks and the Colorado Rockies. Get ready to shop ’til you drop at Kierland Commons. But first, coffee at Starbucks. Ask your barista about coffee-free options for the kids. Lucky, Tommy Bahama, J. Crew, and Anthropologie have apparel. Need a new pair of shades? Visit Solstice Sunglasses. Hungry? Dine at The Cheesecake Factory, Shake Shack, or Mastro’s Ocean Club. If you’re up for even more shopping, Outlets at Anthem offers several popular brands at discount prices; who doesn’t love a good bargain? For apparel, there’s Ann Taylor, Banana Republic, North Face, Gap, and Polo Ralph Lauren. Treat yourself to a new handbag from Michael Kors or Coach. Pick up a new pair of shoes at Skechers or Nike. - The front desk is open daily from 8:00 AM - 8:00 PM daily. If you are planning to arrive after 8:00 PM please contact the property in advance using the information on the booking confirmation. Maximum occupancy of each villa is six, including children.